STEMMER IMAGING’s new line of cameras utilize IDS’ FX4 HDR (high dynamic range) solar cell technology-based sensor for allowing imaging from scenes in environments that consist of both very dark and very light regions. This makes them suitable for use in environments known for great dynamic ranges or unpredictable brightness variations. Featuring a patented pixel structure, the FX4 HDR sensor produces a logarithmic output with fixed noise suppression and offers a 120 db dynamic range. 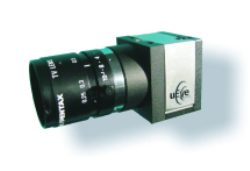 This translates to a brightness ratio 1000 times higher compared to ordinary CCD sensors with a 60-db dynamic range. The logarithmic output helps withstand significant changes in brightness in a scene and at the same time prevent ‘blooming’ and saturation, which is a major issue in conventional CCD sensors that gives images with white patches and causes image data loss. The sensor can be effectively used for traffic applications for identifying details in the vehicle’s dark interior portions even when the headlights are switched on. In welding applications, even the presence of bright light generated by a weld arc does not hinder image quality of the weld seam. Glossy spots and reflections on reflecting surfaces including paints need the use of highly dynamic range sensors. Generally, ATM withdrawal centers are insufficiently illuminated and consequently need HDR sensors for producing quality images. The FX4 sensor offers a 12-bit color depth output. Much like conventional sensors, the FX4 sensor can be adjusted in such a way as to produce linear output in conventional imaging. Operating at a real-time speed of 30 frames/s, the sensor does not utilize integration methods.